Pew Poll: Obama Tops Generic GOP Candidate; No Clear Opposing Frontrunner : It's All Politics President Obama held a 10-percentage point lead over a generic Republican candidate and led among political independents. Meanwhile, no presumptive Republican candidate had a clear lead overall though Mitt Romney led with those in the Tea Party movement while Huckabee led with evangelicals. 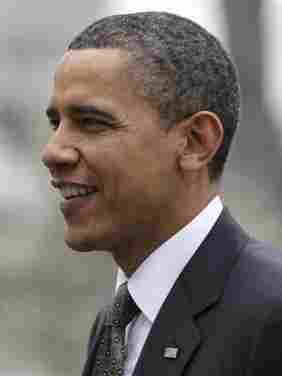 There was good news for President Obama in a Pew Research Center poll released this week. According to the survey, the president led a generic Republican candidate, 47 percent to 37 percent, when people were asked if they preferred re-electing Obama or electing a Republican. The bad news for Obama, obviously, is he won't be running against a generic Republican but an actual one. And who might that be? You'll get little clarity on that from the poll. Among Republicans, former governors Mitt Romney (Massachusetts) and Mike Huckabee (Arkansas) were essentially in a dead heat, at 21 percent and 20 percent, respectively. But among those respondents who self-identified as members of the Tea Party movement, Romney had a six percentage point lead over Huckabee, 24 percent to 19 percent. Huckabee, however, had a wide lead over Romney with evangelicals, 29 percent versus 15 percent which isn't a surprise since Huckabee is a former Baptist preacher. The survey also indicated that Obama had positive re-elect numbers with the all-important bloc of of independent voters, with 40 percent preferring his re-election and 34 percent wanting a Republican elected. But that lead was half of the 12-percentage point lead Obama had with these voters in November 2008. For Obama to win re-election, he'll need to do well with independents, certainly significantly better than the Republican nominee. So this is an area that bears watching. There was also some indication in the survey that the presidential race at this point of the election cycle is just a lot less interesting than people found the 2007-2008 presidential race at the same stage. At a time when the media and the public are tracking major breaking stories on the international and domestic fronts, the early steps in the 2012 campaign have yet to capture much attention. In early 2007, with nomination fights underway in both parties, coverage was significantly higher. Interest was higher as well – especially among Democrats – as Obama, an African American, and Hillary Clinton, a woman, proved to be strong contenders for the party's nomination. according to the Pew Research Center's Project for Excellence in Journalism.